John Caris's book Foundation for a New Consciousness was available from LibraryThing Member Giveaway. John Caris's book Reality Inspector was available from LibraryThing Member Giveaway. John Caris's book Spenser Blake’s Secret was available from LibraryThing Member Giveaway. John Caris's book Dancing Magicians was available from LibraryThing Member Giveaway. 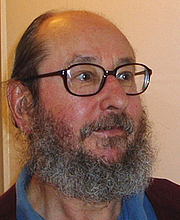 John Caris is currently considered a "single author." If one or more works are by a distinct, homonymous authors, go ahead and split the author. John Caris is composed of 1 name.